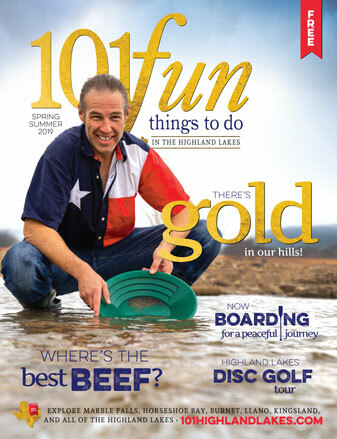 In Texas, the Llano River and the creeks that feed it are popular places for prospectors. Fall floods and spring weather have increased interest in the area, according to Smith, who expects a steady stream of treasure hunters this year. As a heavy metal, gold typically sinks into crevices around rocks and cracks in a creek or river. Removing layers of silt makes it easier to find. The biggest nugget to come out of the Llano River that Smith knows of weighed 4.3 grams. She has a photo of it in her office. Most panners, however, find what they call “float gold” in particles about the size of a pinhead. Float gold is so small it floats with dirt particles stirred up in the water. 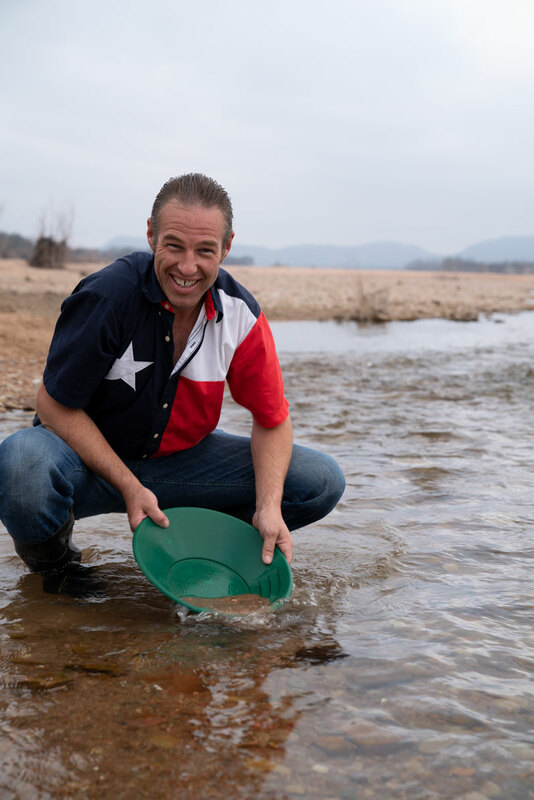 When Rohacek sees that type of gold in his pan, he dumps it into a 50-gallon bucket to take home, where he uses a sluice to separate the gold from other materials. Not everyone has the kind of equipment that Rohacek inherited or that Rocky Moorhead sells at his store near the Kingsland Slab, another popular gold panning location. 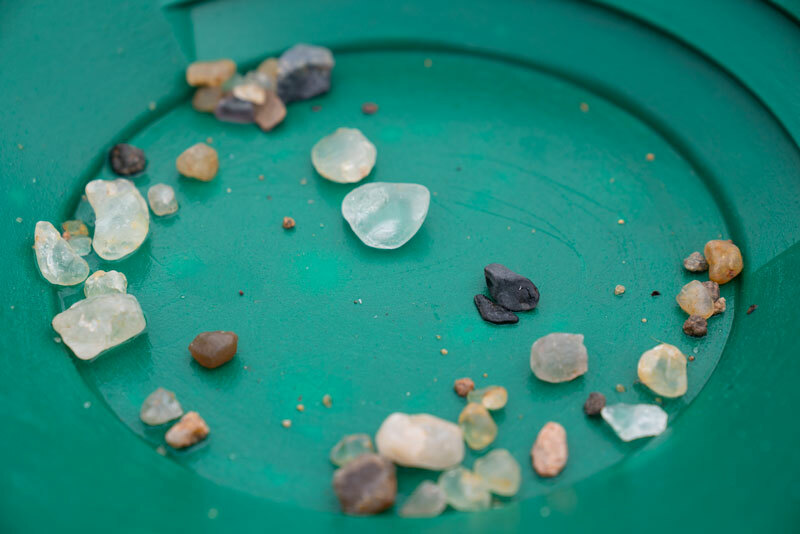 Treasure Hunters Supply and Rock Shop has provided prospectors with equipment and information since 1965 when it first opened in Texas City. Moorhead and his wife, Lois, who live in Marble Falls, moved the rock shop to Kingsland in 2013. Newcomers to the quest for gold, such as Kingsland contractor Cameron West, consider Moorhead a treasure himself. West sometimes pans at Long’s Fish and Dig, which costs $20 a day, but prefers the Kingsland Slab on RR 3404 where he can work the rapids for free. You can pan legally at only a few areas in the state of Texas, the slab being one of the most accessible. The only equipment really needed is a pan, which can be purchased at either Long’s or Moorhead’s shop. Panners also should learn basic mineral laws, which can be found for free online or from other panners. Hunting for gold on federal land is considered mining, which can be done commercially with the right permits. On state land, panners are prospectors and hobbyists: No commercial activity allowed. State and private land used for gold panning still needs to be permitted, which is done through groups such as the Gold Prospectors Association of America. Once a permit is issued, anyone can pan. Llano County is permitted for panning along the banks of the Llano River in the city of Llano, at Long’s Fish and Dig, and about a mile both up- and downriver from the Kingsland Slab. Locations are listed on the Texas General Land Office website. Chances for success, no matter the equipment, increase with experience and by talking with other prospectors. Ask gold panners about techniques and they will gladly share their prospecting perspective. Getting information about specific finds and locations takes some digging. They also talk about the thrill of finding other geological treasures while on the hunt for gold, another common vein that runs through the heart of every prospector. West goes magnet fishing for meteorites while searching for the iron oxide that indicates gold might be near. Prospector Earl Theiss of Llano, whose website prospectingtexas.com contains a wealth of information about the subject, and Rohacek spend as much time searching for local treasures like llanite, topaz, and blue quartz as they do looking for gold. The opportunity to be outdoors exploring and learning about nature drives these prospectors as much as any wish for riches.